White Sands Resort Club is located less than 3 blocks from the the beautiful Gulf of Mexico. The resort offers various sizes of units from two bedroom, two baths; one bedroom, two baths; one bedroom, one bath and studio suites. 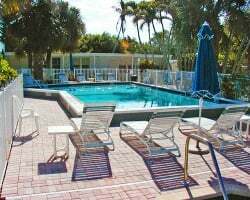 White Sands Resort Club offers a secluded atmosphere, where you can enjoy amenities such as a heated pool and spa, shuffleboard court and BBQ grills. White Sands also provides free bicycles for your use on those short rides to the beach or through elegant Old Naples. With membership, week exchanges for 26,500 RCI points! Spend unforgettable summer vacations in Naples! Make an offer today & start planning your trip!